HICKS, Thomas Holliday, a Senator from Maryland; born near East New Market, Dorchester County, Md., September 2, 1798; attended the local subscription schools; sheriff of Dorchester County in 1824; member, State legislature 1830; member of the State electoral college in 1836 and while a member of the college was elected to the State house of delegates in 1836; member of the Governors council in 1837; register of wills of Dorchester County 1838-1851, 1855-1861; member of the Maryland constitutional convention in 1851; Governor of Maryland 1857-1862; appointed and subsequently elected as a Unionist to the United States Senate to fill the vacancy caused by the death of James A. Pearce and served from December 29, 1862, until his death in Washington, D.C., February 14, 1865; interment in the Cambridge Cemetery, Cambridge, Md. American National Biography; Dictionary of American Biography; Radcliffe, George. 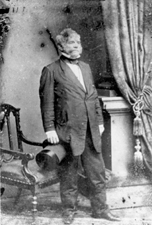 Governor Thomas H. Hicks of Maryland and the Civil War. Baltimore: Johns Hopkins Press, 1901; U.S. Congress. Memorial Addresses. 38th Cong., 2nd sess., 1864-1865. Washington, D.C.: Government Printing Office, 1865.